You will find details on parameters and example configurations on the following pages. When editing a color policy file, please make sure to a <tab> between the name of the parameter and the value. The use of a <space> character will result in a color conversion failure. A "#" at the beginning of a line indicates a comment and prevents the line from being processed. All parameters defined in color policy files take precedence over all settings defined in the user interface. Please note that nonetheless only objects triggered due to the Conversion settings in the user interface will be changed. This applies for all DeviceLink conversions and is not part of the kfpx. If set to On source profiles are removed during conversion. This also applies if ConvertToDestination is set to Off. This parameter over­rides the conversion option for calibrated CMYK of the conversion settings. 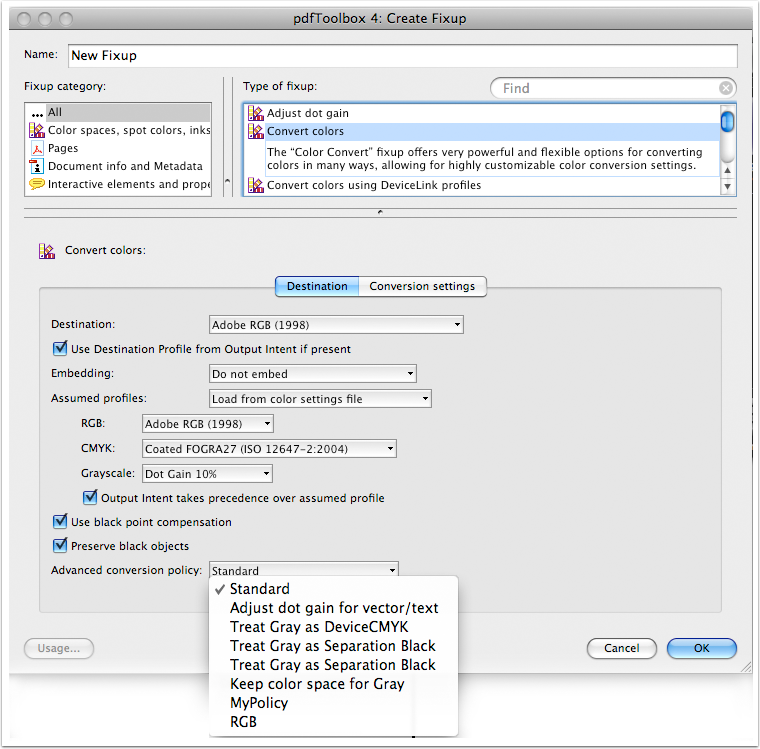 Strictly speaking the 'source profile' for a Lab color space cannot be stripped or removed. Nevertheless, if StripSourceProfile is set to On, the Lab profile specified in Assumed profiles will be used instead – so this is a means to replace a Lab color space for an object with some other Lab color space. If set to On the object is converted to the destination color space as speci­fied in the settings. If the object does not have a source profile, or if the parameter StripSourceProfile is set to On, the profile specified in Assumed profiles will be used as the source profile. If the object has a source profile, and StripSourceProfile is set to Off, the object's source profile will be used. This parameter defines which Rendering Intent is used for a color conver­sion. This parameter overrides the option Rendering Intent of the con­version settings. Note: If there is no Rendering Intent explicitely defined in the PDF the default is relative colorimetric. If the parameter is set to On, Black Point Compensation is used for the color conversion when performing an ICC based color conversion using the relative colorimetric Rendering Intent. This parameter overrides the option Use black point compensation of the destination settings. If set to FromEmbeddedOutputIntent the source profile will be taken from an embedded Output Intent for DeviceCMYK objects. (This param­eter overrides the parameter Assumed profiles). If no Output Intent is embedded an error is returned. This parameter overrides the option Out­put Intent takes precendence over assumed profiles of the destination settings. This parameter disables color conversion for objects that do not have a source profile. Thus, if both ConvertToDestination and PassThroughDeviceColor are set to On, only objects that have a source profile will be converted. Please be aware, that in this regard if StripSourceProfile is set to On the object will be considered as hav­ing no source profile (in essence setting both StripSourceProfile and PassThroughDeviceColor to On has the same effect as setting ConvertToDestination to Off). If ConvertToDestination is set to Off, PassThroughDeviceColor does not have any effect. If only the black channel is used, the object will be converted according to the settings for color space Gray and stored in the defined color space afterwards. This parameter overrides the option Preserve black objects of the destination settings for CMYK. Objects, which are using a blend mode listed in this parameter, will be processed using the normal color conversion and no preservation of black objects will take place. This might be appropriate for objects (with empty colorant channels), that are using certain blend mode, which are using these empty channels to achieve a special effect with underlying objects. If these empty channels would be replaced by a single colorant color space, these effects would not work anymore, so they must be preserved in some certain cases. Please see article "Processing black objects" for further details. This parameter only applies to device dependent RGB color – either if the object uses DeviceRGB or if it uses ICC based RGB or CalRGB but the parameter StripSourceProfile is set to On. It only has effect if ConvertToDestination is set to On. If not set to NoChange, instead of carrying out an ICC based color conversion, RGB colors where each of the Red Green and Blue values are equal, will be converted directly to the corresponding black tint value. For images this will only have an effect if all pixels in the image have equal Red, Green and Blue values. This parameter applies to gray vector and image objects. It indicates which color space to use for gray objects after the conversion. For example, it may be necessary to encode a DeviceGray object as Separation Black object, so that overprinting also works for subjacent CMYK objects. Note: DeviceGray cannot overprint CMYK, even if overprint is set to true, whereas Separation Black does overprint Cyan, Magenta and Yellow once overprint is set to true. Note that both DeviceGray and Separation Black do overprint spot colors if overprint is set to true. If a and b is 0 the luminosity value is directly transferred to the designated color space. This parameter defines the way process colors (Cyan, Magenta, Yellow, Black) in DeviceN or Separation are treated. If set to On, they are treated as DeviceCMYK objects. Not defined color channels are set to 0% in the respective color. To keep the overprint settings, the original color space (Separation or DeviceN) is recreated after the conversion if possible. Use the AdvancedColorConversion parameters to define the treat­ment of newly added color channels. If set to Off, tints in colorants that were originally 0 are preserved. If necessary, new channels will be added for DeviceN (Separation color space becomes DeviceN after the conversion). With AdjustDotGain the dot gain difference between source and destination profile is calcuated and all color values are modified so that the dot gain difference is compensated. This is usefull mainly for standard PCS conversions. KeepZeroChannels causes all channels which were 0 before the conversion to be set back to 0. This might lead to a color shift. Same as AdvancedColorConversion_Primaries but for all objects using exactly two colorants of CMYK. Same as AdvancedColorConversion_Primaries but for all objects using exactly three colorants of CMYK. Same as AdvancedColorConversion_Primaries but for all objects using all channels of CMYK (none of the channels is zero). Same as AdvancedColorConversion_Primaries but for all black objects. Black objects are using only the K channel of CMYK or DeviceGray or Separation Black or DeviceN with only one channel named Black. Specifies the method for recompression of converted images. Note: All processed images are decompressed for color conversion tasks. If recompressing with JPEG the quality level is to be defined with the param­eter JPEGQuality. Please keep in mind that every JPEG compression leads to the loss of quality. Allows for specifying the quality level in which JPEG objects are saved after the conversion. Other values are not supported and will be treated like the next higher supported value. Allows for specifying the transparency blend color space after the color conversion.